The American Prisoners of War Rescued after the sinking of the Japanese transport, Shinyo Maru, by the USS Paddle, SS 263, on 7 September 1944. I believe that there were four stages that the prisoners were exposed to. The first stage is the capture or surrender of the person or persons. The second stage is the treatment of the men and women while in a Japanese prison or work camp. The third stage is the transfer by forced march or transport to other camps or to the Japanese homeland. The fourth and final stage is the rescue and return to the American way of life. The history of the first three stages is well covered by many books. I concentrated on three. “ WITH ONLY THE WILL TO LIVE” edited by Robert S. LaPorte, Ronald E. Marcello and Richard L. Himmell, “ PRISONERS OF THE JAPANESE” by Gavan Daws and “The Shinyo Maru Survivors Reunion, 7 September 1998 at San Antonio, Texas Booklet.” These books describe the life of the prisoners and the brutal treatment, as they were used as slave labor, and their constant battle with hunger and disease. I will cover very little of this history. Stage 3, the transportation of the prisoners, from camp to camp and to Japan via Japanese transports, is well covered by the book “ Death on the HELLSHIPS”, by F. Michno and others. 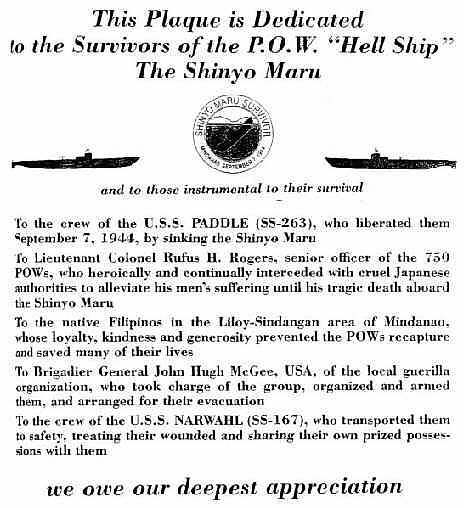 In the fourth stage, I will attempt to list the names and some history of the Prisoners of War that were on the Shinyo Maru, when the USS Paddle, SS263 sunk the ship in 1944. Some of these men swam 3 or 4 miles to a nearby island and later were evacuated by the USS Narwhal SS 167. “Now we come to the movement of the POWs from camp to camp or the homeland of Japan to work as slaves. The Japanese state that about twenty-five ships carrying POWs, from various nations, were either bombed or torpedoed. These ships were not marked in any way to designate them as transporting POWs. The Japanese put them in a convoy as any other ship. Without markings, the U. S. Submarine Captains assumed that he had a prime target. Naturally the prisoners did not know anything about what was happening on the open seas. The Japanese were still loading the prisoners, into unmarked transports, so that they could be shipped to another camp or to Japan. Without the knowledge that the transports were carrying POWs, the submarine Captains and the Bombers continued the sinking until there was nothing to sink. So the POWs, who suffered so much on land, suffered again at sea. They died in the holds, of starvation., suffocation, dehydration, and disease and with no sanitation. They were killed by bombs and torpedoes aimed at them by the allies, their countrymen. When the men tried to leave the sinking ship, the Japanese fired on them or threw hand grenades at them. If anyone was lucky enough to survive this the Japanese in lifeboats would kill them in the water, or they drowned, or they died on the rafts. Or, most terrible of all they killed each other. Now we come to the action of the USS Paddle, SS263, on her fifth war patrol. On 7 September 1944, under the command of Captain Byron Nowell. The USS Paddle after her fourth war patrol had her refit at Fremantle, Australia. 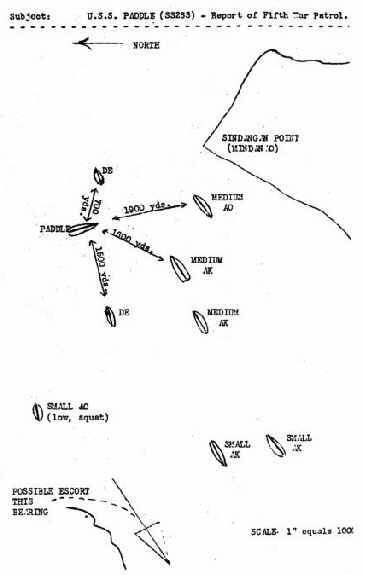 Her fifth patrol was scheduled from 22 August –25 September 1944. I was able to contact a shipmate who was a crewmember of USS Paddle on her fifth war patrol, Godfrey J. Orbeck., CPhM. This is his recollection of this action. 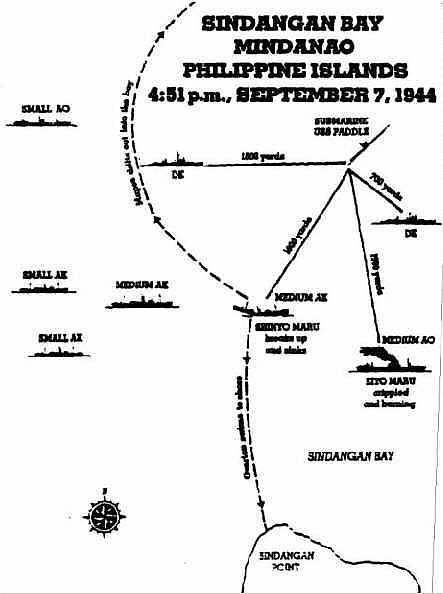 “ We attacked a convoy about a mile or two off Sindangan Point, Mindanao on 7-8 September 1944. We got two torpedo hits on the lead ship, a tanker and two hits on the second ship in the column. We the crew of Paddle [SS 263] were unaware that the Shinyo Maru was carrying POWs [750 of them] until after the war. The escorts, the Captain identified one of them as a Q ship were dropping depth charges immediately. The Skipper ordered deep submergence immediately, but we were light forward, due to the departure of four fish from the forward room. The Skipper ordered all hands, those not engaged in ship’s tasks, to the forward torpedo room since we could not use the trim pump at that time. By the time I got to the forward room, the men of the crew occupied most of the space. I crawled over several men got an unused torpedo skid, which I laid on and later went to sleep. I was standing night watches in the conning tower from midnight to sunrise so day time hours was sleeping time for me. The Skipper of the tanker ran his ship up on the beach to keep her from sinking. They had a machine gun on the stern, which was manned by a Jap gunner who was shooting at the heads of the U. S. Prisoners in the water. Japs in the lifeboats were also shooting at the POWs and would not permit U. S. personnel to get aboard the lifeboats. Paddle stayed deep until the depth charging was over, then we surfaced, reloaded tubes and put in a battery charge. Paddle proceeded northward along the coast looking for the tanker. We were unaware that she had been beached. We had heard breaking up noises from only one ship, the Shinyo Maru. The Skipper wanted to finish off the tanker. Unknown to us 83 POWs made it to the beach. One died on the beach. “The 83rd man was known as Tennessee. But no one seems know to what his real name was. He died about two days after we came ashore, and was buried on the hill in back of the town Sindangan.”8So there were only 82 survivors. The Paddle crew did not find out about the POWs until after the war. 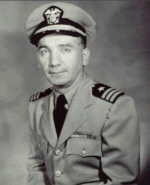 The skipper told Orbeck, that he did not learn about the POWs until he went to the Bureau to check on his orders in 1946. Friendly Filipinos helped the 82 survivors. Most all were clothed only with a G-string. Within a few days the survivors made it inland to a guerilla group, back in the jungle commanded by a U. S. Colonel named McGee. General McGee had been a member of a POW group, some weeks earlier, but escaped and formed the guerilla group in the jungle. General McGee’s group had sent a radio message to the U. S. forces in the south about the 82 survivors. 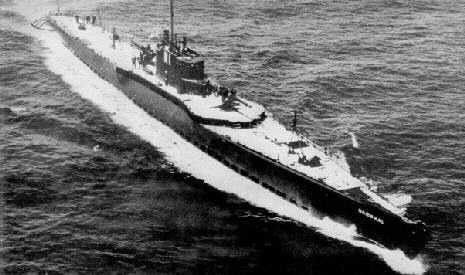 The USS Narwhal SS167 was assigned to pick up these men.”9 The USS Narwhal [V 5] SS167, under the command of Commander Jack C. Titus departed on her fourteenth war patrol on 14 September-5 October. As noted there were only eighty-three POWs that were capable of swimming or by whatever means were capable to land on the beach. It was with great sorry that one of their members, John J. McGee, died shortly after reaching the beach. Of the remaining eighty-two, eighty-one were rescued, one member namely, Joseph P. Coe refused to be picked up. His son-in law Joseph M. Meehan provided this information. “I am a member of ADBC, Inc., No. 3456. I am also a life member of EX-POW, Card No. 15930 I was in the 809th Avn Co. in September 1941 when I came to the Philippines, and was stationed at Nichols Field. The Company later became “C” Co., 803 Avn Engr Bn the week before the war started. I was promoted to 1st Lt. In the Corps of Engineers the month of November 1941. I was on the Death March and started from about Kilometer 210 down to Marvelis and from there to San Fernando Pampanga, where I boarded a cattle car, packed in like sardines to Capiz and thence to O’Donnell, Marvelies. I was trucked from O’Donnell to Camp 3, to the Airfield at Lasang; at Zamboanga, about 3 September 1944 I was transferred to the hold of the ship Shinyo Maru. The USS Submarine Paddle, sank this Hell Ship on 7 September 1944 in Sindangin Bay, Mindinao, PI. Most of the [about] 800 POWs died when the 2 torpedoes went off in the holds where we were packed and the Japanese shot the rest in the water as we were swimming away from the sinking ship. All that was left of about 800 POWs that had been on the unmarked ship were 83 men who managed to reach the shore near Saindangin and one man died the next day, leaving 82 survivors. 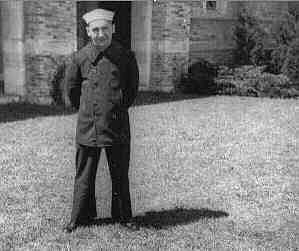 I was able to leave the Philippines by way of the USS Narwhal, and eventually wound up in Brisbane, Australia in the Army Hospital there, along with other survivors of the sinking Shinyo Maru. I have a complete list of the 82 survivors, [ I am one of them ] and there are 25 of these men alive today. Contact me if you want any information from my list." Clem narrated the following: “ The Japanese put 250 of us in this forward hold. And in the after hold they put another 500 men. The ship would travel a little ways and stop; it might stop several hours and start up again. We were aboard this ship altogether about nineteen days and eighteen nights. You had room to sit and lay down; the food was a little better. Well, late one afternoon we heard the Japanese bugler blowing general quarters, and in the process of blowing it he trailed off. He just pooped out, hit some sour notes. Suddenly the Japanese pulled the hatch covers off and dropped hand grenades down in there and then turned machine guns down the hold. Well just about the time they started that, there was this explosion. What had happened was that a torpedo had hit the ship. Personally, the only thing that I remember was that I saw a flash, and everything turned an orangish-colored red. No feeling, no nothing. Every-thing just turned a solid color. I don’t know if the grenades went off first or the torpedo because it all meshed together. As I said, everything turned red on me, and I assume that’s when the torpedo hit. The next thing I knew, I was kind of flying, just twisting and turning, and there were clouds of smoke all around me. I couldn’t see anything but these billowy forms like pillows. I thought I was dead. Then I opened my eyes, and reality came back. I was underwater in the hold of this ship, and these pillows were the bodies of other guys in there. Some of them dead; some of them were trying to get out. The ship was filling up with water, and I thought it had already sunk; and I thought I was trapped down in it, and I thought I was going to die, sure enough. So I figured the quickest way to get it over with was to go ahead and drown myself. So I opened my mouth and thought I’d drink some water. I found that my head was above water, and I was just gulping air. I looked up, and I could see light coming through this open hatch. Then I thought, ‘Well , I can get out of here.’ In the meantime, all this water was rushing up toward this hatch, and the ship was filling up and sinking. I had actually been forced into a corner and was away from the hatch, and this was one place where it was everybody for themselves-survival of the fittest. Everybody was clawing at each other trying to get to the hatch. You’d pull one person out of the way to get a little closer to the hatch. I finally reached the hatch, and two other guys and I pulled ourselves out at the same time. Up on the bridge there was a machine gun spraying the hatch. A burst of machine-gun fire caught all three of us and knocked us back down in the hold. We’d all been hit. I got plowed in the skull. Another bullet chipped out my chin. Nevertheless, I was able to work myself back up on deck, and I was eyeing that bridge when I came out that time. The gun was still there, but the gunner was laying out on deck. Somebody had apparently got up there and killed him. At this time I found out that we were out in the ocean about two or three miles from shore. All I had was a loincloth. All I could think of was getting to that land and getting some water or coconut milk. I couldn’t see out of one eye on account of the blood. I’d reach up there, and I knew I was shot. I figured I was in pretty bad shape, buy I still wanted to get to shore and get something to drink. You could barely see the land. So the first thing I thought of was that I had a long swim. I pulled off my loincloth so that I had nothing to encumber me in swimming. Also, I had been down in the hold for nineteen days and eighteen nights, so I didn’t have a lot of strength. Anyway I dove over the side, and when I hit the water I happened to look up, saw that we were part of a convoy because there were many ships around. The other ships had putout lifeboats to pick up Japanese, but they were shooting all the Americans. They were shooting them, or some of the officers were taking swipes at their heads with sabers. There were Japs all around me. Hell, there were lots of Jap troops on this ship. Then there was a seaplane patrolling for this convoy, and we had to contend with him. He’d make a pass and strafe us. In the meantime, I couldn’t hear a thing because, I found out later, both my eardrums had been perforated in the concussion of the explosion. I was as deaf as I could be, so in the swimming all I could sense was little shocks in the water, and I didn’t know what it was. I’d look around and the water would be spraying up, and it was where somebody was shooting. We swam and we swam, and my right arm just finally got to where I couldn’t swim, I couldn’t move it, couldn’t pull it over my head. It was completely paralyzed, useless. I found out later that while I had been swimming I’d been shot twice—once in the arm and once in the shoulder. We got to the beach a little before sundown. Two of us got into some trees off the beach, and a Filipino walked up. He had on a pair of cut-off dungarees, and he took them off and gave them to me, and then he climbed up this coconut tree and got a bunch of coconuts and cut them down for us. We walked about a mile inland and came upon this hut with several Filipinos standing around. They gave us some water—I never could get enough water—and then they took us to a village probably five or six miles away. Then they started to bring other Americans into this village. We stayed there that night, and there were eighty-three of us that showed up. There were 750 of us on that ship, and only eighty-three of us got ashore. Reunion: It should be noted that these POWs have had reunions. Their last one was in San Antonio, Texas on 7 September 1998. There were seventeen present. Some were in no condition to travel, one died in a car accident on his way to the reunion, and some felt that it was too far to travel. 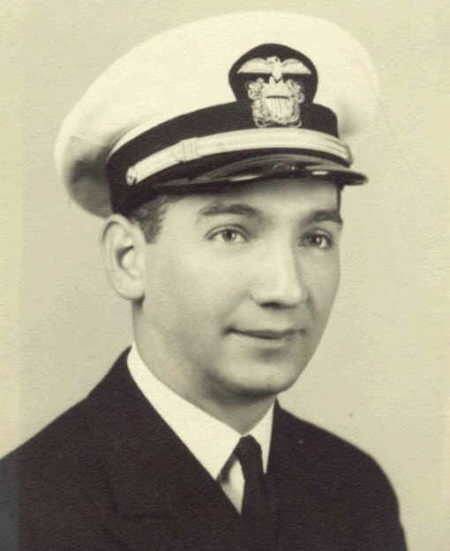 There were seventeen members and others in attendance, wives and children of the attendees, and one of the men from the USS PADDLE, Godfrey J. Orbeck CPhM, the submarine that sunk the Shinyo Maru . 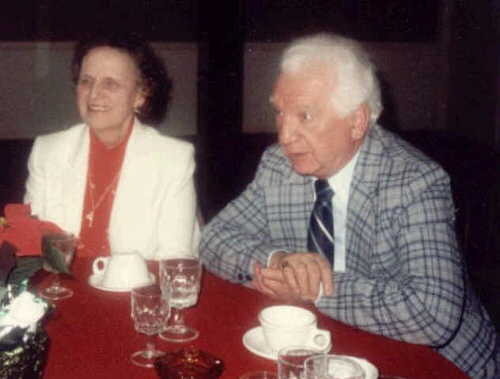 One of the widows was there, Peter Golino’s wife. One woman who was the daughter of the Camp Commander at Lasang, our last POW camp. Plus there were a few others that wanted to visit with us because they had relatives that were on the Shinyo Maru and went down with the ship. 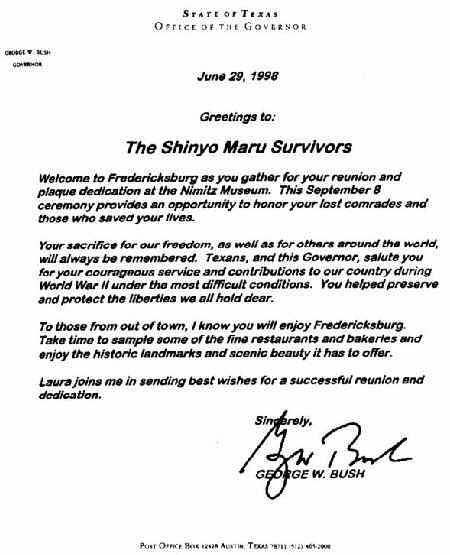 They had a welcoming letter from the Governor of Texas, the Honorable George W. Bush. They also received the Nimitz plaque. Shinyo Maru Survivors Reunion , 7 September 1998, at San Antonio, Texas. Letter from Godfrey J. Orbeck, CPhM, USN. With Only The Will To Live edited by Robert S. LaPorte, Ronald E. Marcello and Richard L. Himmell. 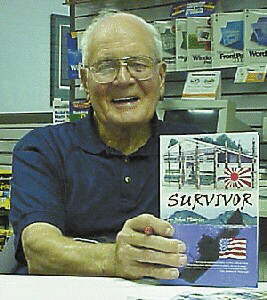 A book on the Shinyo Maru has been written by survivor John Playten (photo below).